I had a discussion with an online friend recently about urban versus rural life ... the friend lives in Washington, D.C. and he told me that he thought life in a smaller town would inevitably be "barren." His statement was something I'd heard many times before, but it still disappointed me. I know I'll never understand people who think that having a few more restaurant choices is more rewarding than being able to see a Montana sunset. And even discounting the sunsets, there are wonderful experiences out here. I was thinking about that last night, when I volunteered to help with an evening called "Story under the Stars." 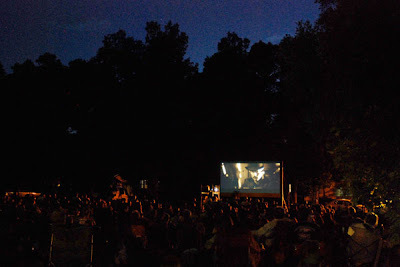 It's an outdoor film festival being held on the grounds of the Story Mansion, one of Montana's finest historic homes. Our group gave tours of the old mansion, and then folks set up a movie screen on the lawn. There were hundreds of people there, spread out on the grass with bags of popcorn, and the evening was perfect. A real community event, and a fine time ... and another reminder that life out here is far from barren. What a super event that would be...if I'm not mistaken that's Redford's opening scene in my fave film of all time. I've probably seen it at least 20 times...but never under a night sky such as this. We're going to Cataldo to check out the Mountain Man Rendezvous and the new visitor's center at the Old Mission today. Something new for us as small town 'survivors'. I worked one summer at the Mission...beautiful historic grounds. And I hope you had a good visit out to Cataldo yesterday! I haven't been out that way in ages ... I really need to make a pilgrimage out to the new visitor's center sometime. I'll let you know when the Sacred Encounter collection arrives...it hasn't yet. We didn't go into the church yesterday...just a run through the center and a reminder to the Ranger on duty that I had once been a co-worker. I took only a couple pics of the building...the one most dramatic change is there's more, better parking area, and thre are steps instead of a sloping walkway...either one of which leaves a body breathless. The Center structure is supposed to represent the long lodges of yore. The Rendezvous was camped right next to the church, and really was not nearly as large as the one event when I was working there...but it was quite nice...had I the dosh I might have bought a blanket shirt, or a linen night shirt...$65 and $75 respectively. The period dress is always interesting. Sounds like a very nice day ... and those Rendezvous events are definitely fun! I like those blanket shirts, too. I was a park ranger in Glacier for a couple of seasons (after my summers at the hotel), and when I go back I always look for former co-workers ... but there aren't all that many of them left. Makes me feel old. Hope you can make it, Courtney! It's definitely a great community event.